Pilots are trial episodes of TV shows made in the hope of acquiring sponsors and a network run. 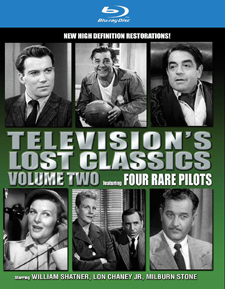 Television’s Lost Classics: Volume Two contains four of these pilots, but the term “classics” is loosely used, since three of the pilots were never picked up as series. The first, 1951’s The Case of the Sure Thing, is the pilot for Racket Squad, which had a prime-time run on CBS from 1951 to 1953. The episode opens with Philip Morris’ spokesperson Johnny in his bellboy uniform, shouting “Call for Philip Morris.” Capt. Braddock (Reed Hadley), who works in the racket squad of a metropolitan police department, introduces the episode while smoking a Philip Morris cigarette and singing its praises. The episode is about a scam to get a mark to bet a large amount of money in a phony gambling parlor. Millburn Stone, who would later star as Doc on Gunsmoke, is approached by a woman on a train. She sets the scam in progress and is joined by accomplices in an elaborate scheme. This show includes original network commercials. Cool and Lam (1958) is based on Turn On the Heat by Erle Stanley Gardner, who introduces the episode. It stars Benay Venuta as Bertha Cool, the head of a private investigation firm, and Billy Pearson as her associate Donald Lam. It was an attempt to capitalize on the success of Perry Mason, also based on stories by Gardner, which premiered on CBS in September 1957. Acting is stiff and the plot appears rushed. Venuta is Ethel Merman-like in her look and get-out-of-the-way delivery and, in fact, replaced Merman in Anything Goes on Broadway in 1935. Pearson, completely miscast, would be more at home playing a thug or gangster. Most of the show is played on indoor sets, with only one brief outdoor street scene. Alison Hayes (Attack of the 50 Foot Woman) and Movita (1935’s Mutiny on the Bounty) are in the cast. Jacques Tourneur (Cat People) directs. The Life of Riley pilot from 1948, starring Lon Chaney, Jr. (The Wolf Man), is the first of two made. The second starred Jackie Gleason as Riley. Wiliam Bendix eventually nabbed the title role and starred in it on NBC from 1949 to 1958. You can see why the networks passed on Chaney’s version. He has virtually no comic timing, shouts his entire performance, and comes off more as an abusive idiot than a goodhearted, blue-collar Everyman. The plot involves a missing $5 bill. Riley accuses his son, and one uncomfortable sequence involves him threatening to “give him a licking” with his belt. Sets are small and claustrophobic. An original Pabst Blue Ribbon beer commercial is included. Nero Wolfe (1959) stars Kurt Kasznar as Wolfe and William Shatner (Star Trek, Boston Legal) as his assistant, Archie. The episode, Count Me Down, finds Wolfe in bed with a bad cold while trying to solve a murder. Kasznar overacts shamelessly while Shatner delivers a pretty good performance in a secondary role. The show follows the Agatha Christie technique of rounding up a group of individuals in one place as the master detective reveals the guilty party and tells how he solved the crime. Interestingly, the murder occurs in the control room as a rocket launch countdown takes place. The show, based on characters created by Rex Stout, never made it on the air, but two later shows featuring Nero Wolfe did, one in 1981, starring William Conrad, the other in 2001, starring Maury Chaykin. All pilots were originally shot on film and they are presented in this Blu-ray release in new high definition restorations. Quality is better than the kinoscope restorations on Television’s Lost Classics: Volume One. All are in black and white with mostly flat lighting rather than the more atmospheric lighting characteristic of big-screen movies. The only bonus feature is a blooper reel. Blooper Reel – This collection, hosted by James Arness, features blown lines by actors, prop mishaps, and funny animal mistakes. The shows represented are Have Gun Will Travel, Gunsmoke, Hennesey, Rawhide, The Red Skelton Show, and The Twilight Zone.